May the new year be filled with music and mirth…. 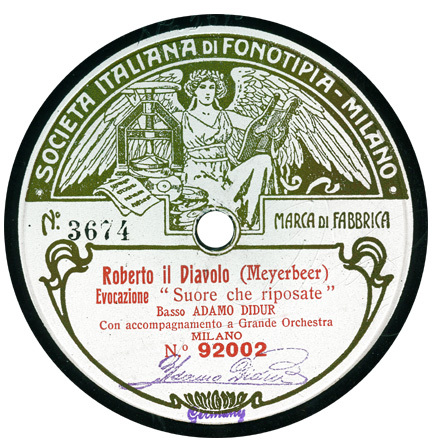 The Gramophone Company began producing “complete” operatic recordings in Italy in 1906. The earliest attempts were rag-tag productions, sometimes with different singers substituted if those originally scheduled couldn’t make a session; and in at least one case, a domestic Red Seal recording had to be substituted for a missing side in the U.S. There were no Carusos or Farrars or other Red Seal–class celebrities to be heard — even had their Victor contracts allowed them to record for The Gramophone Company, their astronomical royalty rates would have driven the price of these sets beyond the means of most customers — but the recordings caused a sensation nonetheless. There are reports of record stores staging “Victrola Opera Nights” using these records, with costumed locals lip-synching their parts. You can find much more about them in A Phonograph in Every Home, available from Mainspring Press. Here are some highlights from a later, better-organized attempt, recorded in Milan in 1915 but not released in the U.S. until March 1919, on the lowly black-label series. These sets pre-date the “album” concept — i.e., the records were sold individually, and the big arias handily outsold the less-juicy portions — so assembling complete sets can be a daunting task. Our Cavalleria Rusticana set is growing steadily, but still has a ways to go. Discographic data from the Gramophone Company files, courtesy of the late Dr. Alan Kelly. Trump and the congressional Republicans who have chosen to make their bed with him are responsible for what happens from now on. There is now no one to blame if they can’t pass budgets, avoid shutdowns, deal with sequestration, replace Obamacare, destroy ISIS, or reverse the continuing loss of manufacturing jobs. If climate change gets worse, it’s on them. If Syria continues its downward spiral, it’s on them. If more countries acquire nuclear weapons, it’s on them. Specifically, let them eat Jean-Georges Warm Chocolate Cake. But let them start with Young Garlic Soup with Thyme and Sauteed Frog Legs. Let them follow that with Diver Scallops, Caramelized Cauliflower and Caper-Raisin Emulsion. And let them proceed to Niman Ranch Lamb Chops with Mushroom Bolognese and Pecorino… That’s what President-elect Donald Trump and Mitt Romney ate when the billionaire met with Mr. Forty-Seven Percent to discuss a job in the incoming administration. Remember Trump’s talk about taking on the elites and the well-connected? Well, you can stick a sterling-silver fork in it. REV. A. W. NIX & CONGREGATION: How Will You Spend Christmas? From a tape dubbing supplied by the late Mike Stewart.